Magnetic resonance imaging (MRI) is a technique that allows doctors to see inside the body in remarkable detail without using radiation. Instead, MRI uses a powerful magnet, radio waves, and a sophisticated computer system to produce pictures of various parts of the body. 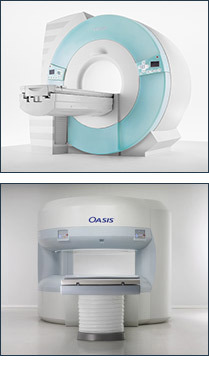 All Metro Imaging facilities feature high-field, non-claustrophobic MRI units. Our West County, North County and Richmond Heights offices feature the Siemens MAGNETOM Espree. Our South County and St. Peters offices feature the Hitachi Oasis. Very little preparation is required. You may eat, drink, and take your medications. Prior to the scan, you will be encouraged to use the restroom. You will be asked to complete a questionnaire before your MRI exam. Because of the potential harmful effects associated with some metallic objects in a magnetic field, you should tell the technologist performing your exam if you have had any surgeries, or if you have a pacemaker, aneurysm clips, metal in your eyes, metal implants in your ears, an implanted drug infusion device, shrapnel or bullet wounds, or permanent eyeliner. If you have ever been a metal worker, you may be required to have special x-rays before your exam to make sure there are no metal fragments in your eye(s). Tell your doctor if you are, or suspect you might be pregnant. You will be asked to remove all metallic items from your person, such as watches, jewelry, hairpins, eyeglasses, and hearing aids. Also, do not take credit, bank, or parking cards with you into the scanner - the magnet will erase the information recorded on the metallic strip. An area for the safekeeping of your valuables is provided outside the scanner area. A registered technologist will discuss the procedure with you and answer any questions you might have. A radiologist will review your medical history and then tailor the MRI study specifically for your medical problems. You will be positioned on the MRI table by the technologist. A device called a coil may be placed over or wrapped around the area to be scanned. You will then be positioned under the magnet. You will hear a tapping noise as the MRI scans are taken. You will be offered ear plugs or headphones with music to reduce the noise. You are encouraged to bring your own music (compact disc). It is very important to hold completely still while the scan is being performed. At all times, the technologist will be able to see you and communicate with you on a two-way intercom. Most procedures take from thirty to sixty minutes. For some exams, contrast will be injected into a vein in your arm during the procedure to enhance the images. The contrast used for MRI does not contain iodine. The technologist will show your examination to the radiologist, and additional images will be obtained if needed. What will happen following my MRI exam? After your MRI exam, you may resume your normal activities, diet, and medications unless instructed otherwise by the technologist or your doctor. Any contrast given for your exam will be eliminated in a day or two. Your examination will be reviewed by the radiologist after the exam has been completed. If you choose OnSite Results, your preliminary results will be given to you before you leave our office. * Your physician will be sent a detailed final report by fax or mail. * We perform evening MRI exams for patient convenience. If your MRI exam is scheduled in the evening, results are called to you the following morning.